The San Francisco 49ers are eager to build around quarterback Jimmy Garoppolo this offseason, but as the franchise focuses on building through free agency and the draft, general manager John Lynch and head coach Kyle Shanahan will have difficult decisions to make with a pair of the team’s own free agents. 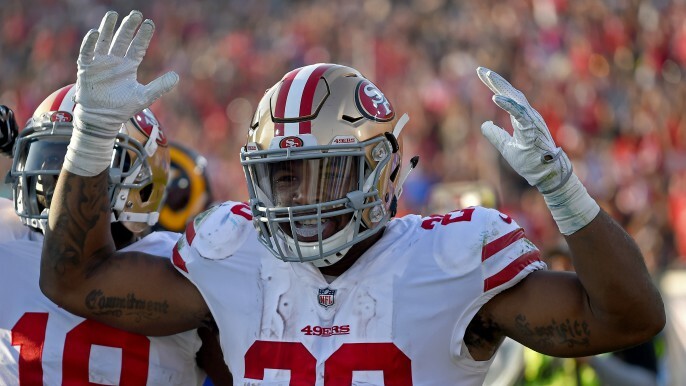 Running back Carlos Hyde and strong safety Eric Reid are no longer under contract with the 49ers, which means both players will be free to sign elsewhere this spring if they choose to do so. On Wednesday morning, Matt Barrows of The Sacramento Bee joined Murph & Mac on KNBR and offered his thoughts on whether each player will be back with the 49ers in 2018. While Reid’s protests during the national anthem may limit interest from potential suitors around the league, Barrows said Hyde faces a different issue in free agency. With a glut of talented running backs preparing to enter the NFL Draft, teams might find an equivalent player who wouldn’t cost nearly as much as Hyde would this offseason. Barrows indicated it’s still possible both players return to San Francisco next season, but Hyde may find a potential 49ers’ contract offer underwhelming, while Reid may not want to ink a deal with a team that doesn’t plan to start him. Because the 49ers expect Jaquiski Tartt to start at strong safety next season, Reid may be the odd man out on defense, which could compel him to look at different options in free agency. One potential landing spot for both players if they don’t return to San Francisco? The Seattle Seahawks. To listen to Murph & Mac’s interview with Barrows, click the podcast link below. To listen to Barrows discuss Reid and Hyde’s free agency situations, skip ahead to the 9:55 mark.